Home / Sew-alongs / Join us for the Charlotte Skirt Sewalong! Join us for the Charlotte Skirt Sewalong! So, a sewalong... excellent! When does it start? And long will it last? The first post will be going up on Monday 14th January, 2013 and we'll be done at the beginning of February - just in time for Valentine's Day - and we can't think of a sexier silhouette for the hawtest day of the year...! We'll be publishing two posts per week, with six posts altogether. The sixth post will be a bit of a Charlotte Skirt party, a sew-and-tell showcasing all of your wonderous creations! Do I need to have a blog to get involved? Not at all! 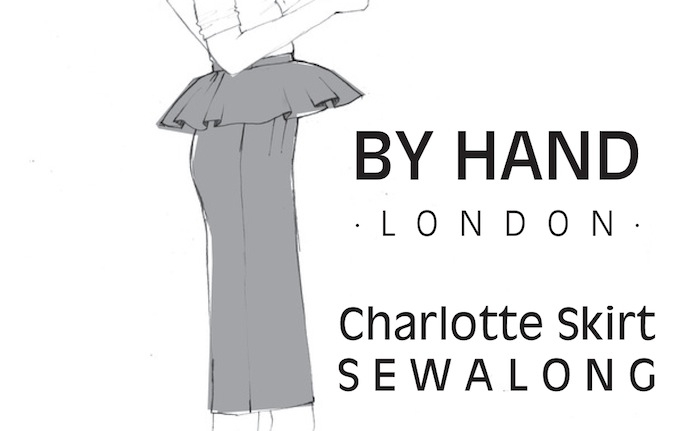 Anyone can join in the sewalong - the main aim of it being to break down the steps in even more detail, take you through some basic alterations and ways in which you can personalise your Charlotte Skirt. If you do have a blog, or a Tumblr/Flickr/Pinterest/Facebook/Twitter/Instagram etc you can document your progress, submit your make for our sew-and-tell and even encourage your followers to join in too. Of course, you don't even have to get involved in the sewalong right now - the sewalong posts will be up on the blog forever for you to come back to as and when you feel like it. However, if you want to be included in the sew-and-tell you will have to be finished on time! Post #1: choosing your size, tracing and cutting, altering the pattern for a full hip adjustment (FHA). Post #2: assembling the skirt - darts, side seams, zipper, back seam. Here we will also show you how to alter the side seams for a more fitted, wiggle silhouette. Post #3: peplums & ruffles! Post #4: attaching the waistband. Count me in! What's my checklist? Fabric. We've recommended medium weight woven fabrics with a teensy bit of stretch. Things like wool, flannel, denim, velveteen and brocades are best. Check the pattern specifics for how much fabric to buy according to which variation you'd like to make. Make sure you pre-wash your fabric before cutting! There is nothing worse than making a beautiful garment that you want to wear all the time, only to discover that it shrank after the first wash. Ugh. Been there. Never again. Pre-wash!! An invisible zipper to match (or contrast!) your fabric, 9 - 11" long (fuller bottomed girls will need a longer zip!). An invisible zipper foot for your sewing machine. This will make your life a lot easier. A worthwhile investment if you don't already own one. A hook & eye/snaps/buttons etc to fasten your waistband. We will be covering the various fastening options in detail. A spool of matching thread. It's a good idea to buy this at the same time as buying your fabric (or keep a swatch with you) to make sure you get a good colour match. Various dressmaking supplies: a sewing machine, fabric scissors/rotary cutter, paper scissors, tracing paper, pens & pencils, pins, a hand sewing needle, a tape measure, tailor's chalk, an iron. If you'd like to officially sign up for the Charlotte Skirt Sewalong, just leave us a comment below with the name of your blog (if you have one), Flickr, Facebook, Pinterest or wherever you'll be documenting your progress or posting pictures of your finished skirt so we can see what you're all up to! You can also grab the Charlotte Skirt Sewalong badge - simply save the image below onto your computer and attach the following link to the image in your blog layout. Clicking on it will swiftly take you to all the Charlotte sewalong posts, and help spread the word!! I’m definitely in! This is an amazing idea, how do I find your patterns? Congratulations!!! I just ordered this pattern, so by the time it gets here I’ll be a little too late for the sew-along, but I’m so excited for the ruffle. Hi, I have my pattern and fabric. Here goes! Aiming to make more stuff for myself this year and thought it would be fun to join this sew-along. I’ve bought both patterns and I must say I was proper impressed with how quickly I received them. I’m thinking that the Elisalex top and Charlotte skirt would come pretty close to the dress I keep trying to draft for myself so…might try to do that later in the year. All the best to you with this venture. Here at By Hand HQ we call that the ELISALOTTE! Really cool that you’re joining the sewalong, excited to see your progress. I’d love to support some Indies by buying what I need for this project from them so would love some links. There are some amazing indie sewing boutiques cropping up all over London and the UK these days – our particular faves (although we’re totally biased as they stock our patterns!) are Ray Stitch in Islington and The Village Haberdashery in West Hampstead. Both also offer online shopping for beautiful fabrics and good quality tools and notions. Hope this helps! Great. Thank you. Will take a look at these now….online only alas, as in Lancashire. Great stuff Lynn! We heartily approve of that new year’s resolution. Just give us a shout in the comments as we’re going along if there’s anything you need extra clarification on. Hello I shall be sewing along with the sew-along and I shall chart my progress within my blog http://cutsewandwear.blogspot.co.uk/. I am rather poor at updating my blog so this will hopefully encourage me to be more proactive with my blog. I’m in please! So excited! Just received the pattern in the post. Yay! Yes, I’ll be joining in with the sewalong! Just ordered my pattern, so hopefully it arrives in Australia before the fun starts. I am posting yours out today, so even with the squiffy holiday post, it should definitely be there before the fun starts. Hurrah that you’re getting involved! Yay! I just ordered my patterns! I’m going to try and join, if my sewing machine is still working by then! It’s a little on the fritz now with all the time I’ve spent messing around over the holiday! Cool that you’re in for the sewalong, Laura! Also really glad to hear you’re not traumatised by our Australia shipping costs, getting shipping costs down is a big mission for 2013. Pigeon post is not being ruled out.